Two Koenigs are in an arcade practicing their hoverboard skills. Two watchdog agents are looking for them with a “no kill” order. They are confused when they find two Koenigs. Sam Koenig dives behind a bar and engages in a firefight. Billy arrives in time save his brother. When Billy Koenig heads outside in pursuit, he’s taken by the Watchdogs. Sam calls into Coulson. Coulson tells the team that Koenig has the Darkhold. They figure Radcliffe must have led Nadeer to the Koenigs. Fitz has the Radcliffe LMD paralyzed from the neck down. He, Simmons, and Mack try interrogating him to find out where Radcliffe is. The LMD claims to be the victim and tells them that things are not as they seem. Billy Koenig is brought back to the Watchdogs submarine base and placed in a room with Radcliffe, who is also bound to a chair. Koenig doesn’t recognize Radcliffe, and Radcliffe tells Koenig that he works for share and that the Watchdogs double-crossed him after he told them that Koenig had the book. Koenig says he doesn’t know what Radcliffe is talking about. Sam Koenig joins Coulson’s team. He says he’s lost Billy’s trail. A man visits Koenig and Radcliffe and threatens them. He refers to himself as “the superior man” and moves in to begin torturing Koenig. Radcliffe frees himself and tells the man to stop. Radcliffe plans to get inside Koenig’s head instead. Simmons is helping Fitz reprogram the Radcliffe LMD to be more honest. Fitz discovers the Radcliffe LMD is far more advanced than AIDA’s. Fitz’s attempts to alter the code causes the LMD to speak in another language, but Fitz can’t figure it out. Quake and Sam look over the surveillance footage from the arcade. Coulson and May join them. Even Sam didn’t know Coulson gave Billy the Darkhold, and Coulson doesn’t know what Billy did with the book. Radcliffe begins mapping out Billy’s brain. Radcliffe and the Superior agree that they’re after similar goals. Fitz continues to struggle with the Radcliffe LMD. Fitz doesn’t believe he can crack the code, but the LMD says that’s just Fitz’s father talking. The LMD reveals he knew Fitz’s father. They were classmates. The LMD begins telling Fitz about a meeting with his father a few months ago, but Fitz unplugs him. At SHIELD, Sam tells Coulson’s team that he handed the Darkhold off to LT Koenig, the “original” who got them all into SHIELD. Mack asks Simmons about Fitz’s father. Simmons says Fitz’s father was not a good man. He walked out on Fitz’s family when Fitz was 10. Fitz doesn’t want to find him. Quake enters a club looking for LT while May and Coulson wait parked outside. May and Coulson lean in for what may be a kiss when Quake calls them inside. Koenig takes to the stage and begins a kind of slam poetry rant. A woman attacks. The poet is Thurston Koenig. The woman is his sister, LT Koenig. Back on the Zephyr, Thurston, LT, and Sam argue. Quake discovers the Superior is Anton Ivanov, a reclusive industrialist who collects military antiques, including a submarine. LT reveals that she returned the Darkhold to Billy as part of operation “hot potato.” Billy put it in the Labyrinth, a secret SHIELD vault. Radcliffe retrieves this information from Billy’s memories. The Superior thinks Radcliffe is putting too much faith in machines. Aida takes down the Superiors men and Radcliffe asks the Superior to turn the ship around. Simmons finds Fitz. He’s feeling like he’s stuck in a loop of trusting other people – Ward, Radcliffe, his father – only to be betrayed. Simmons says that he still trusts people after all of that is why she fell in love with him. Fitz gets an idea. Sam leads Coulson and May into the Labyrinth while Quake and LT wait in the entrance. LT says growing up with four identical brothers meant gross laundry with enough DNA to build a clone army. Fitz examines the brain. It’s the brain made of light that Aida created using the knowledge from the Darkhold. The LMD’s let’s slip that there’s another brain, and Simmons realizes it was May’s. In the Labyrinth library, Fitz and May share a kiss. LT warns them that they’ve got company just as Sam returns with the Darkhold. Sam hands the Darkhold off to May. When Coulson asks May to hand it over, May pulls a gun on him. May simply keeps yelling that she can’t hand it over and Coulson realizes that May is an LMD. 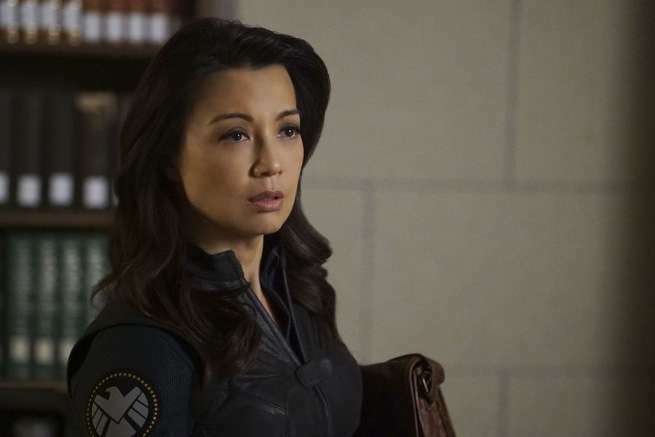 The LMD is about to shoot Coulson when Quake shows up and takes her down with her powers. Coulson grabs the Darkhold and runs. The Watchdogs offer Billy in return for the Darkhold. Coulson tosses them the bag and they release Billy. As the Watchdogs reach for it, Quake uses her powers to knock the Darkhold back. A fight breaks out. Billy grabs the Darkhold. He sees the May LMD on the ground. He tries to help her and she knocks him out and takes the Darkhold. Radcliffe arrives and takes the Darkhold and leaves the LMD behind. Back on the Zephyr, the team tallies their wins and losses. The Koenigs reveal that they were part of the original LMD program but as technicians, not robots. 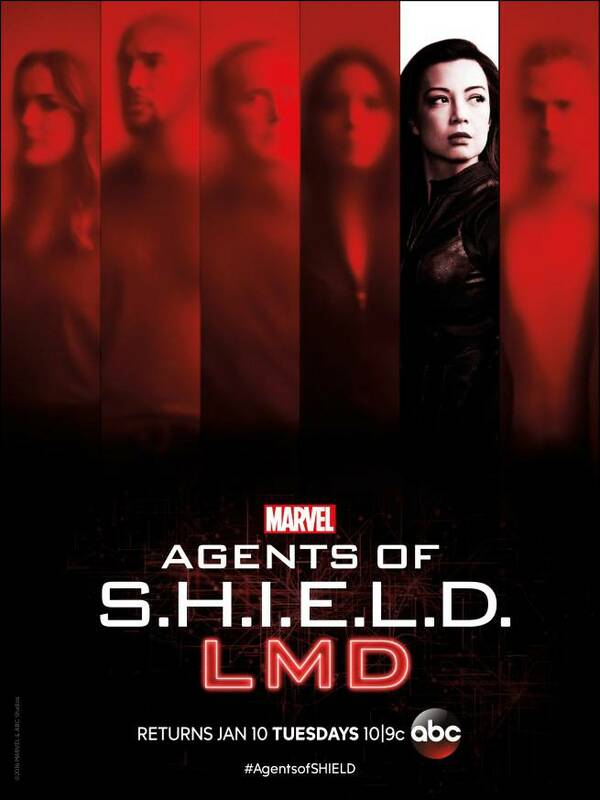 The Aida head and Radcliffe LMD are burned, but Coulson can’t bring himself to dispose of the May LMD yet. The Superior and Radcliffe toast to their success. The Superior wants to destroy the Inhumans and that which brought them upon the Earth. He says that there is something that’s always there when these aliens problems happen and he believes this man is responsible. It is a man that’s always standing behind, out of focus, in the shadows – when Mjolnir touched down when the Chitauri came. A man who died and then returned. The man is Coulson.